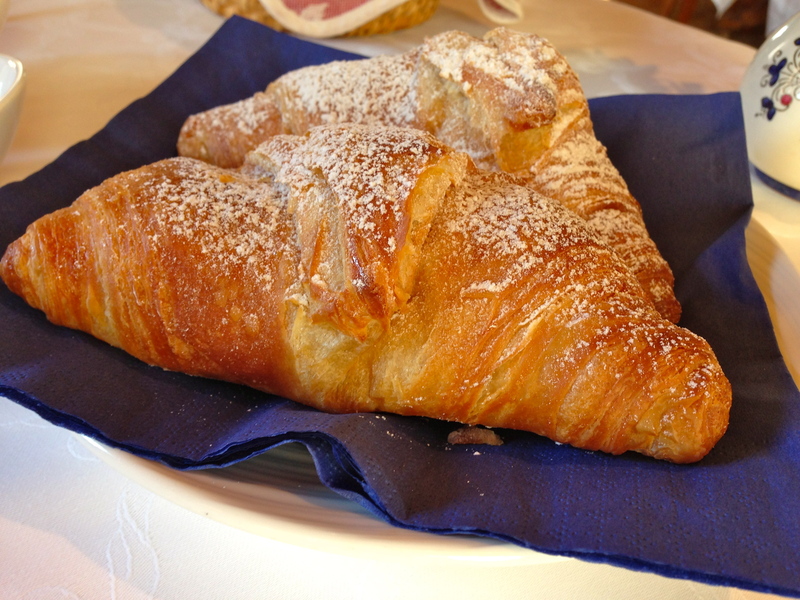 The third day began with another beautiful breakfast. 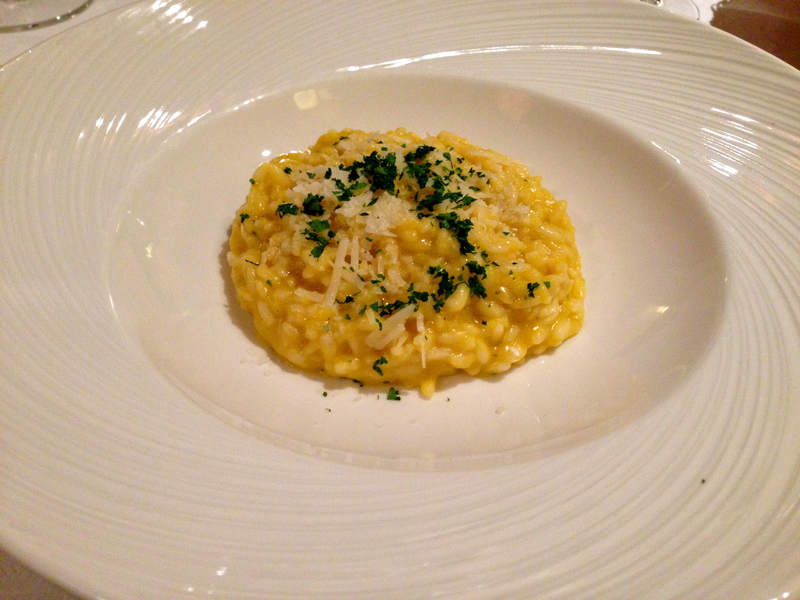 The daily, delicious meals were becoming habitual and routine. I had to remind myself that after tomorrow, I would no longer be feasting on such delights morning, noon and night. But for now, breakfast was served! 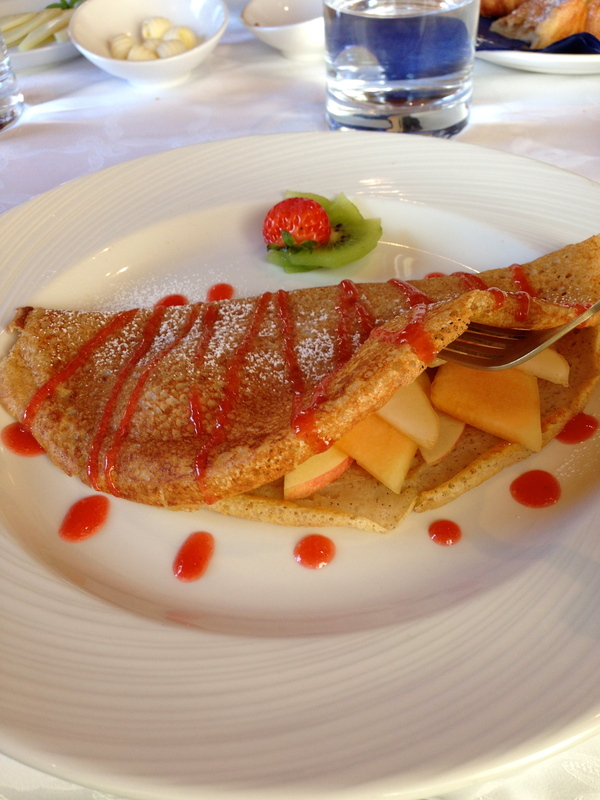 After the usual spread of treats, warm, thin pancakes filled with fresh fruit arrived. This time, I went out of my way to stuff myself with as I could as I would be needing the fuel for the day’s journey ahead. 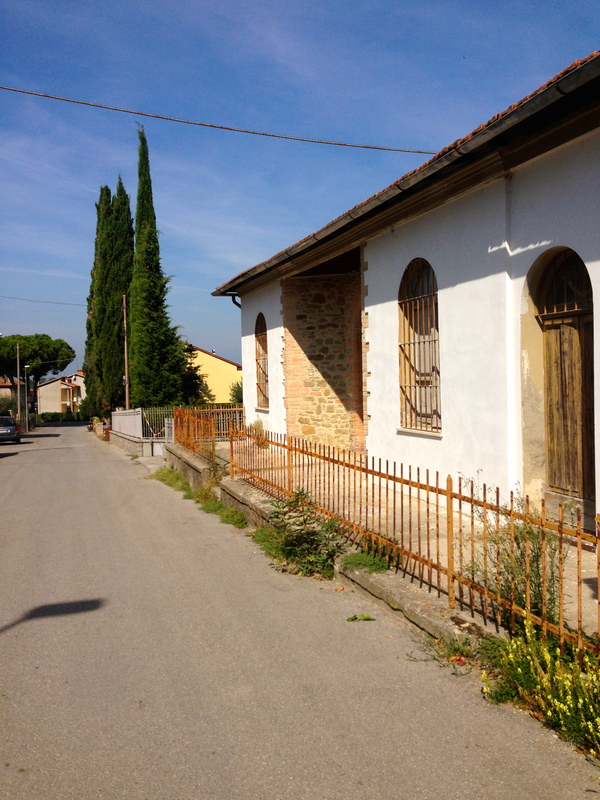 We quickly changed, grabbed bottles of water, loaded up on sunblock and headed out for Lake Trasimeno. 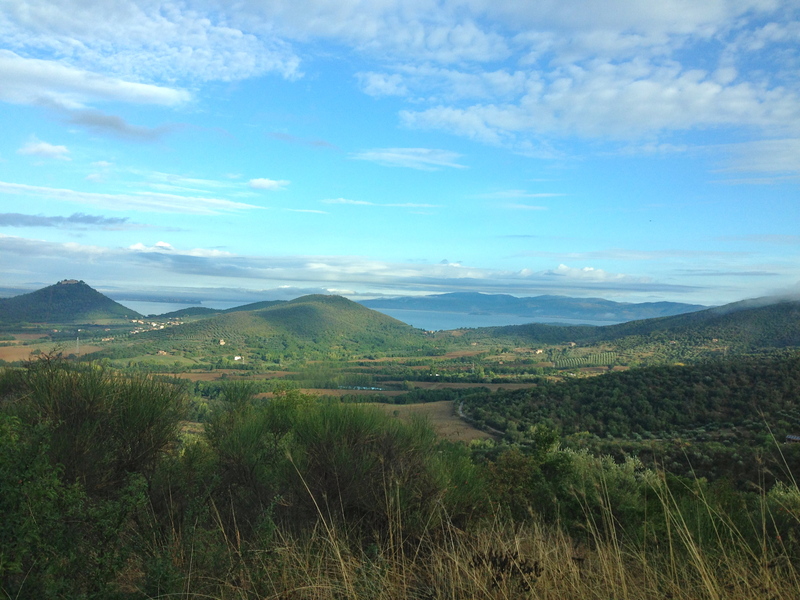 The walk was 3miles through the forest-covered mountain, down past the olive groves, through the little lakeside town and out towards the lake. Our only directions were to keep left at the fork in the road and to be back in time for dinner. Alberto assured us that if we weren’t back in time, he would send Leo out to find us with a little bottle of wine strapped to his neck. 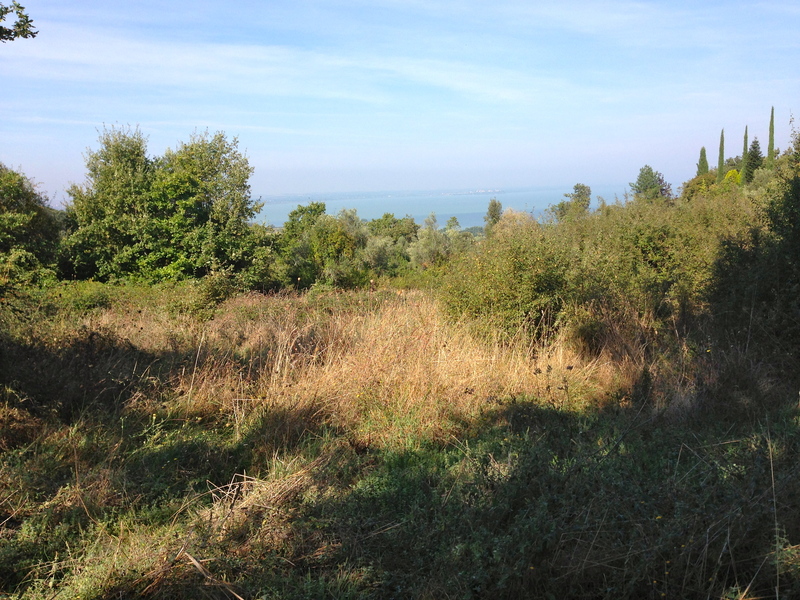 After about an hour of navigating rocky inclines and steep slopes, we could see our destination, Lake Trasimeno glistened off in the distance. We passed abandon summer homes. 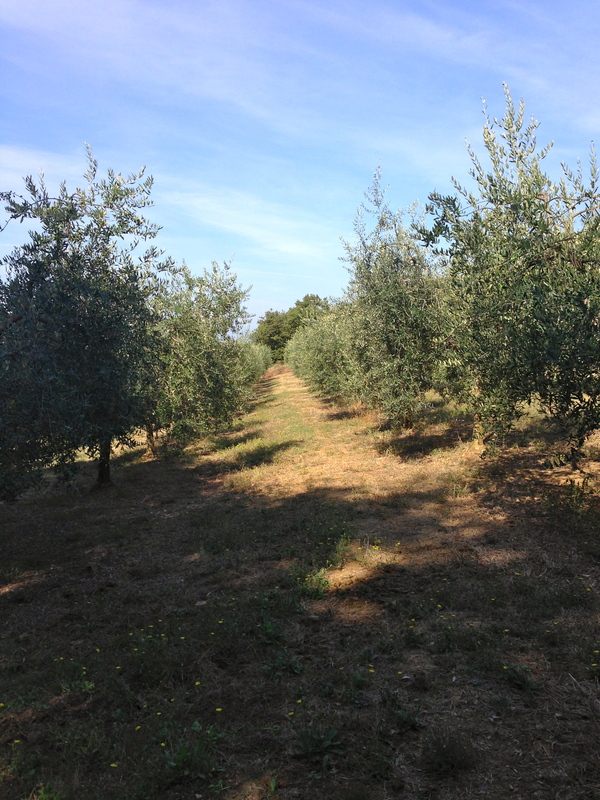 We passed olive groves. 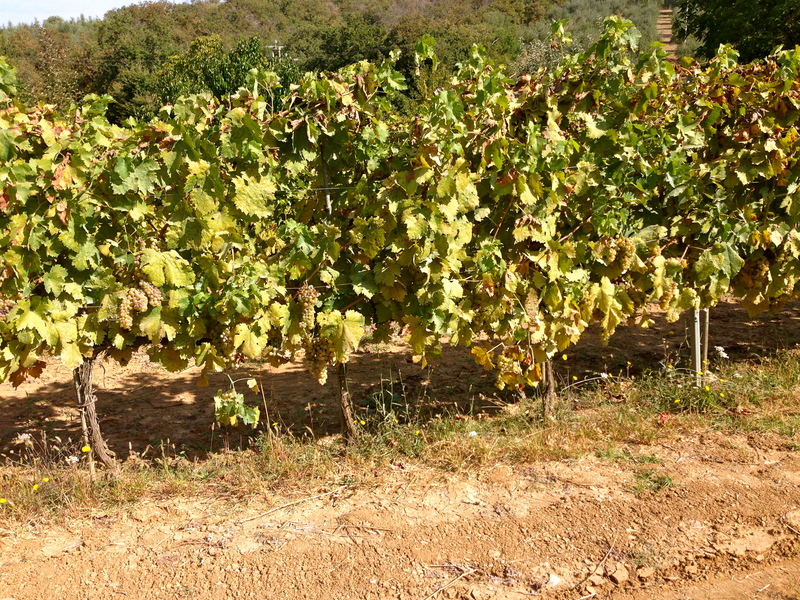 And we passed vineyards. 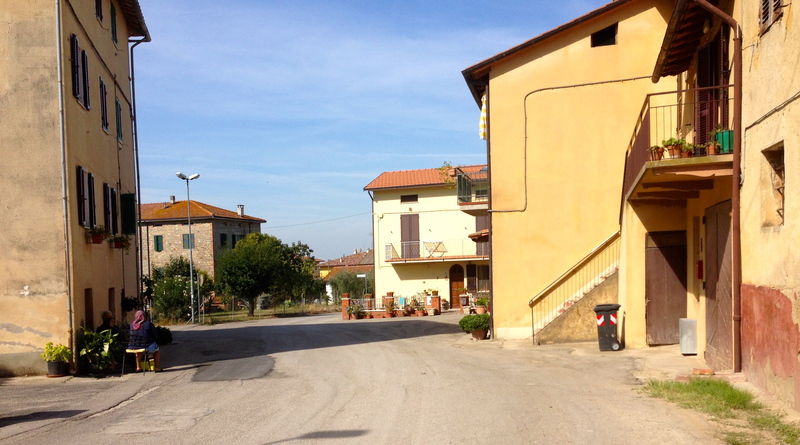 Until we arrived in the lakeside town of Sant’arcangelo. 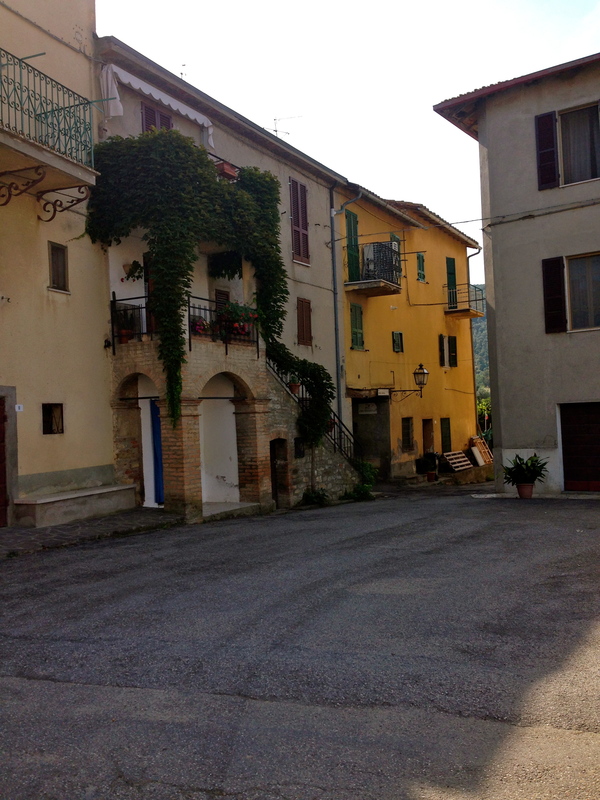 This was a very sleepy town complete with washing hanging to dry on the line, dishes clattering in kitchens and of course three little old ladies gossiping from their chairs in the shade. At the bottom of the town, we passed an original food truck. 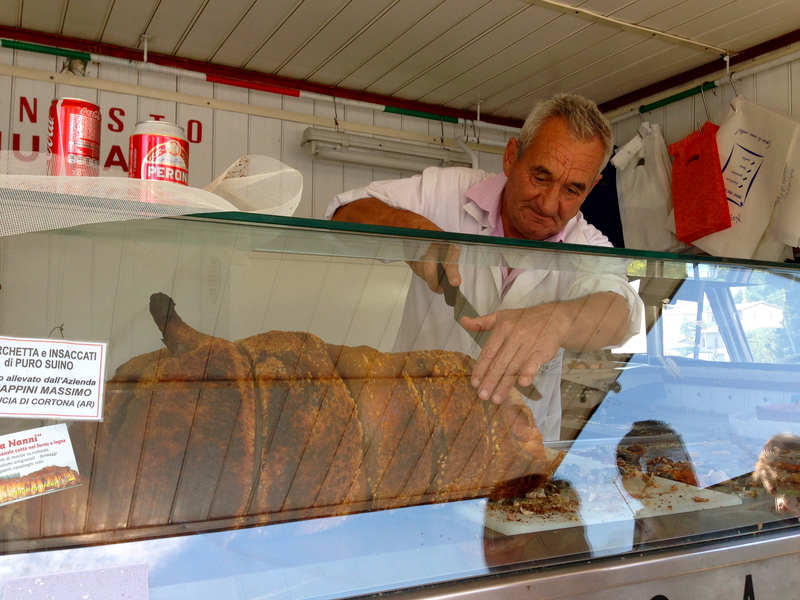 This man pulls up in his truck every day to sell big chunks of traditionally cooked porchetta. I planned on trying this on our way back, but had already filled up on something else… something amazing. 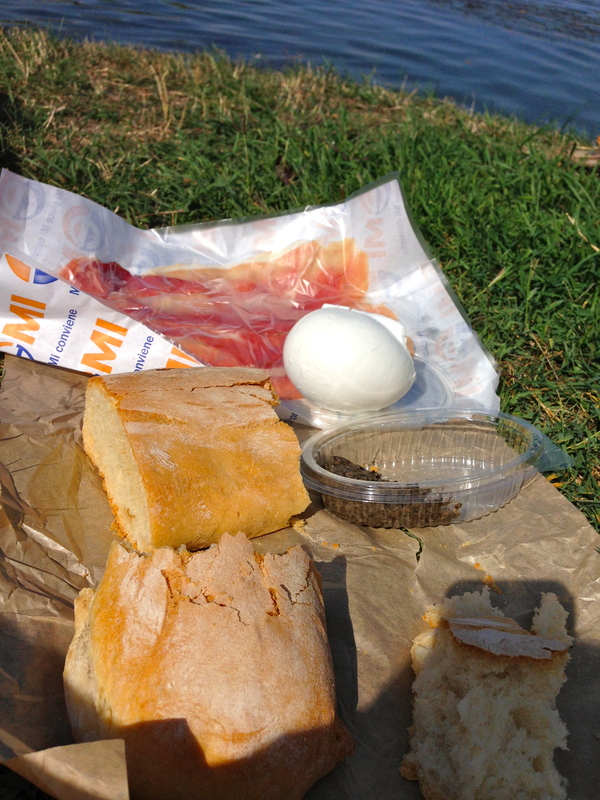 Nearing the lake, we stopped quickly at a little delicatessen and grabbed a few vital ingredients. 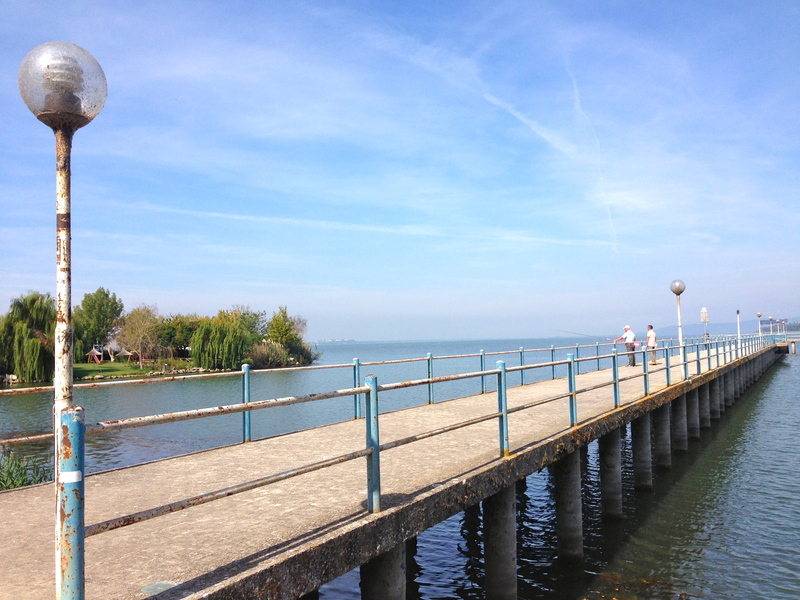 Then, finally arrived at Lake Trasimeno. We sat down on a patch of grass, looked out over the lake and watched two men battling it out for the bigger catch of the day. It didn’t take long for hunger to take over and we pulled out our treasure of a picnic. 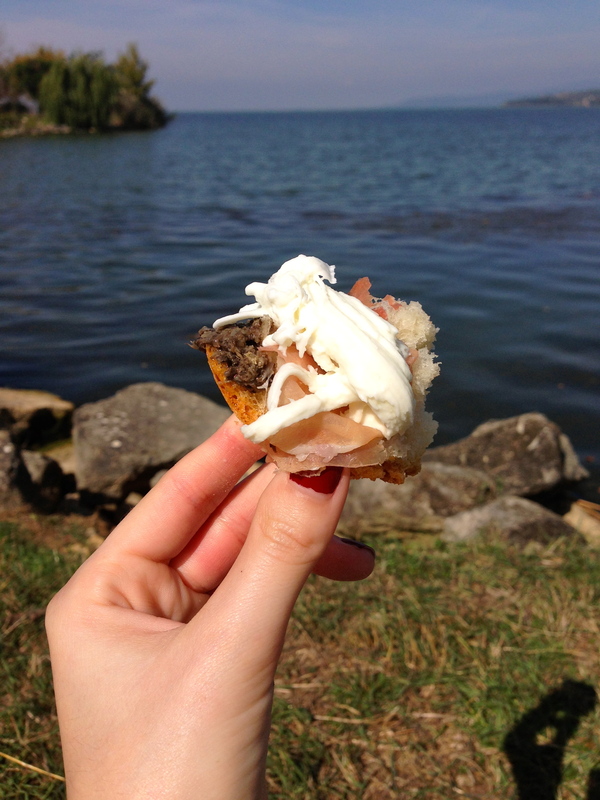 Fresh Mozzarealla di Bufala, salty strips of prosciutto, crunchy ciabatta and the real gem, salsa di tartuffo. We picked at it with our hands, creating perfect bites combining all the delicious ingredients. Each mouthful was more delicious than the last. I sat there gazing out over the water, feeling incredibly small and very grateful to be indulging in such a delicious meal. 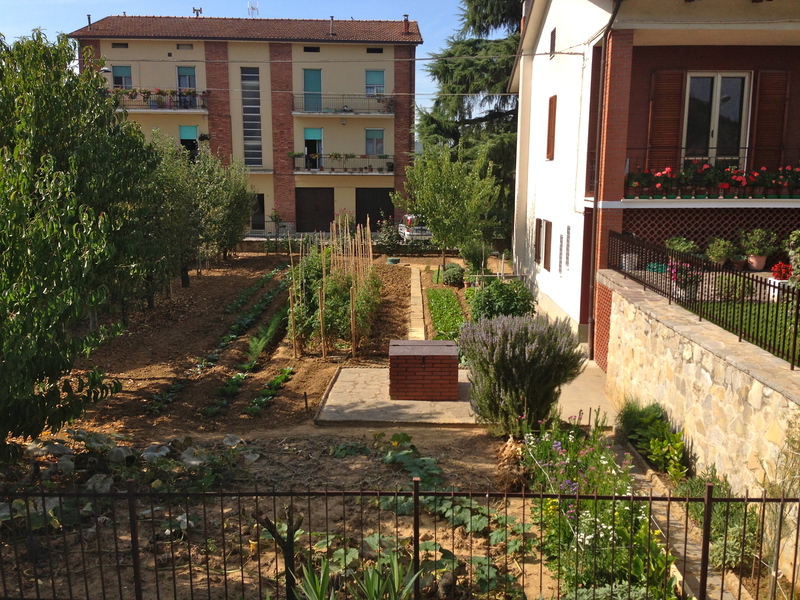 It was one that I know my late Italian grandfather would have loved to share. I’m sure, however, he would have somehow managed to get his hands on a bottle of Prosecco to wash it all down. As we finished up the crumbs, I noticed we had attracted quite a gathering of hungry friends. 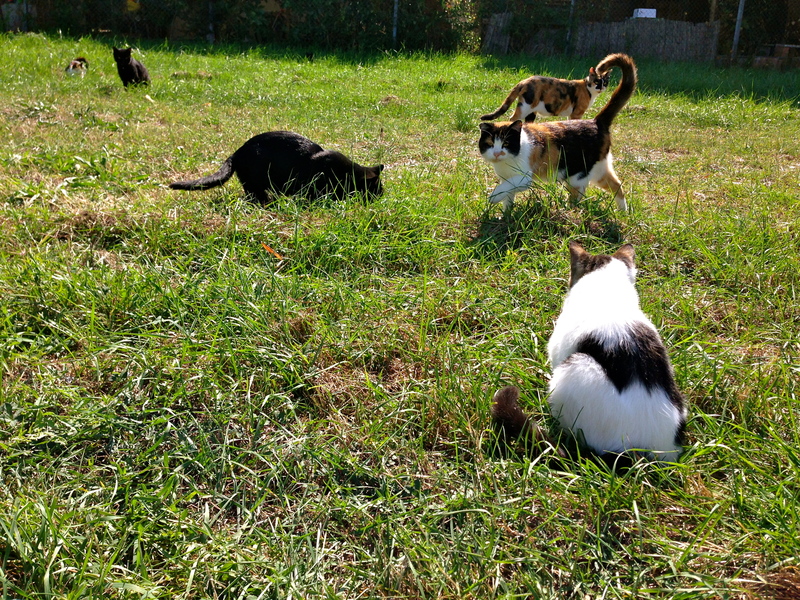 The countless stray cats continued to appear out of nowhere, so I tossed a few pieces of prosciutto fat and fled the scene before the cat fight. Full of delicious food and reenergised from our rest, we lazily began our 3mile journey back up into the mountain. The sun was really shining now and we decided to pace ourselves as we climbed up and away from the lake. Having finally reached our destination, I quickly stripped and ran down to relax poolside. Before long, my new furry friend arrived for some love and affection. I’m sure if you follow me on Instagram @alessandra_ldn, you’ve already seen what I indulged in next. 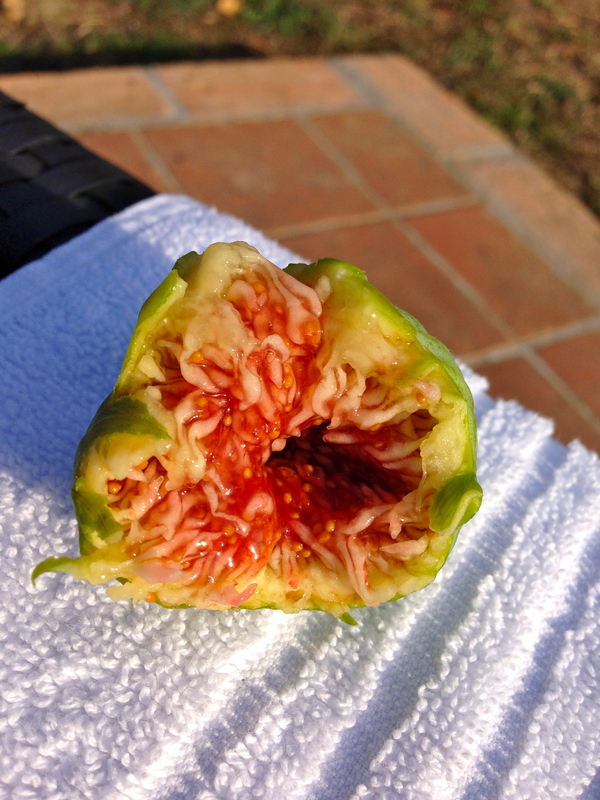 Starting to feel hungry before dinner, I snacked on some ripe figs straight from the tree. As you can imagine, pure bliss. 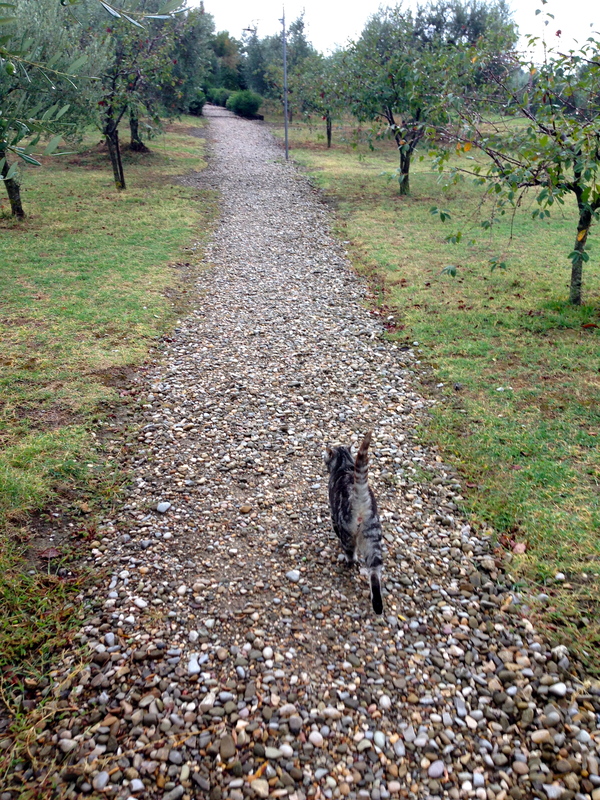 Nearly time for dinner, I quickly changed and took a starlit walk to the main house lead by several of my furry friends. Wondering if the day’s luck could truly continue, we were presented with yet another evening of fabulous food. 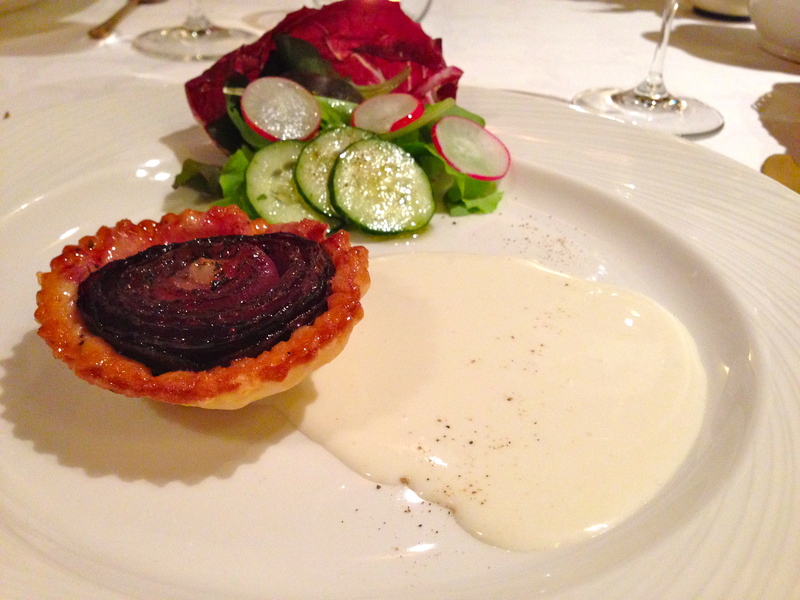 To start, a beautiful caramelised onion in puff pastry, with melted parmesan cheese ice cream. 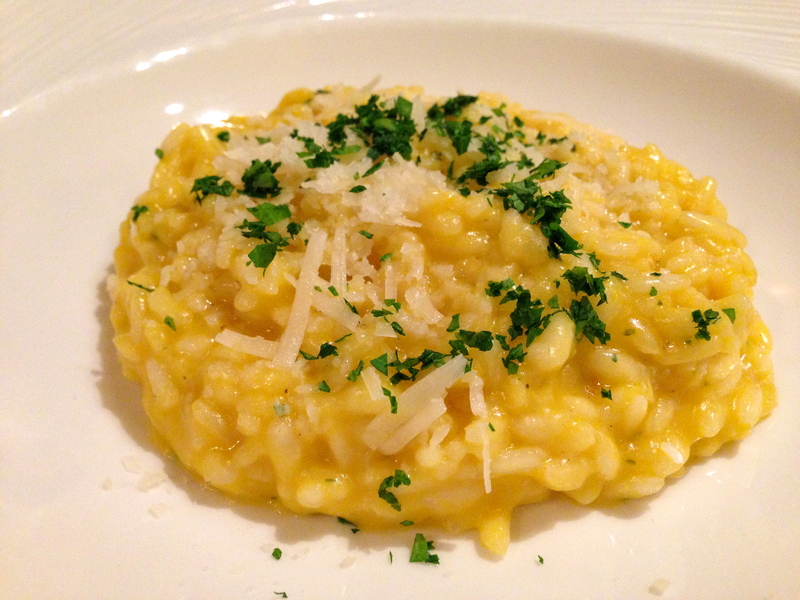 Followed by ginger and lemon risotto. 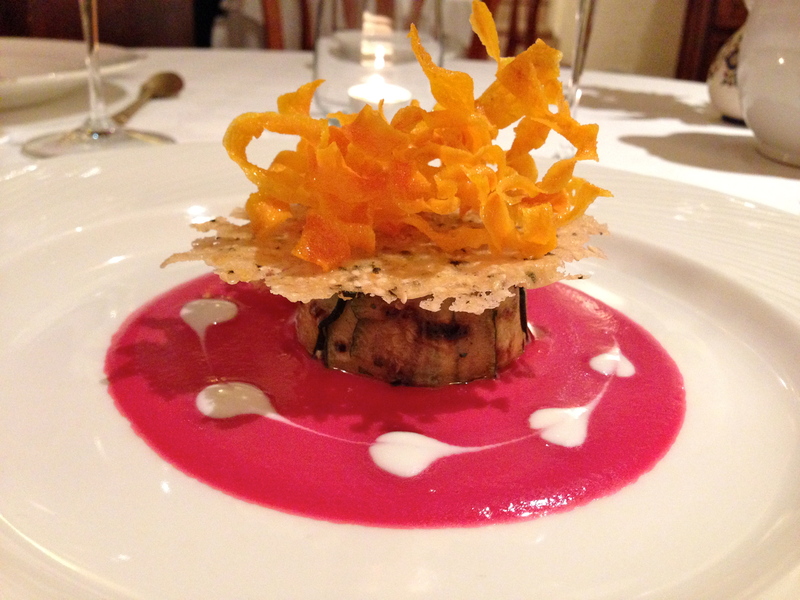 Then the show stopper: a melange of zucchini and ricotta on a beetroot coulis with a parmesan crisp and fried carrots. 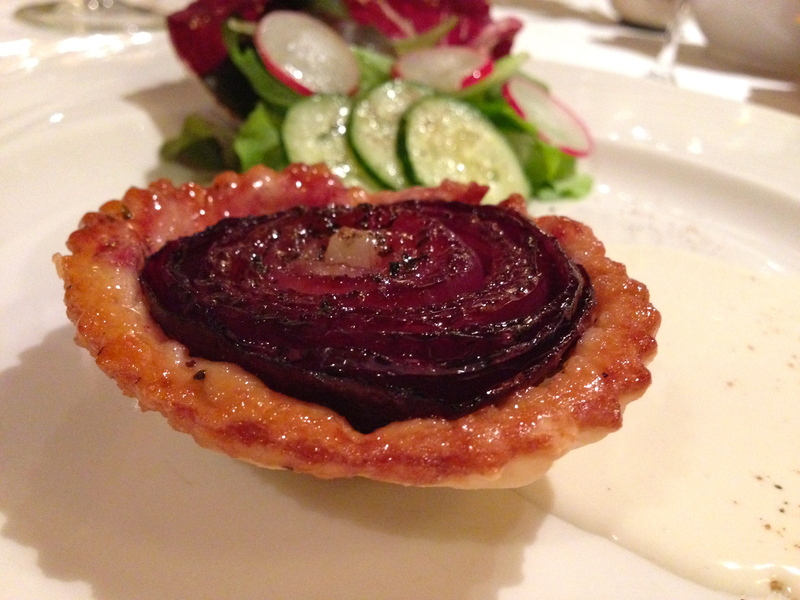 I was delighted to find that beetroot in Italian is barbabietole. Isn’t that fun to say? I’m now giggling imagining you sitting their sounding this out to yourself. 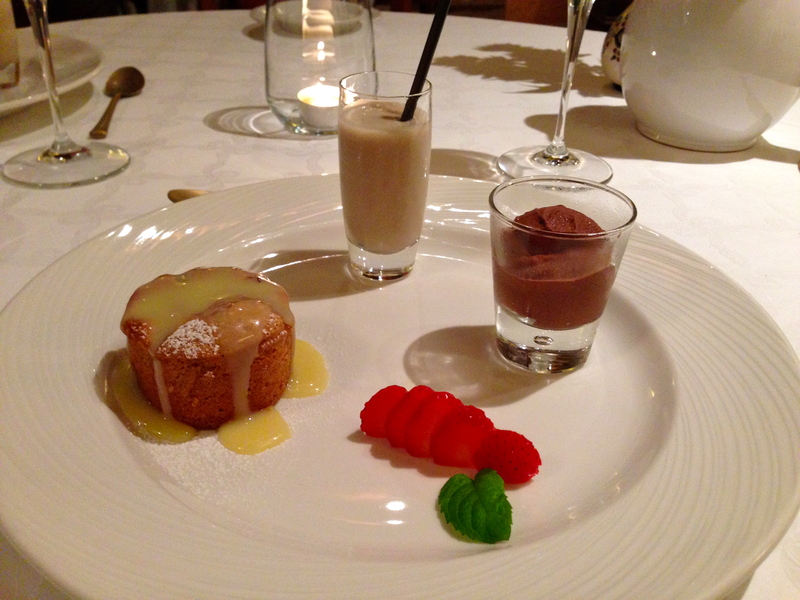 They say all good things come in threes – and when it comes to dessert, this rule always applies. A trio of pear cupcake with white chocolate ganache, bitter chocolate & strawberry ice cream and a cocktail of banana & rum were the perfect way to end the night. Given our amazing day the day before, we weren’t necessarily prepared for today’s storm. It started in the night and continued relentlessly, becoming progressively worse throughout the day. But, I’ll tell you more about that later. 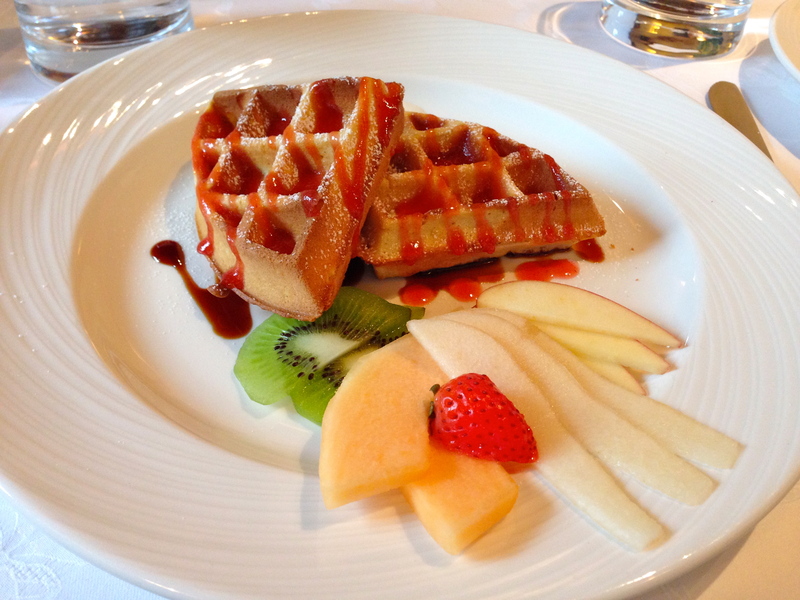 At least the day started with waffles. This softened the blow that there would be no sunshine for the next 24 hours. But of course at this point, cutting into my fluffy, warm waffles, I was blissfully unaware that the sunshine would stop on my plate. After a very drawn out breakfast trying to wait out the rain, we eventually ran for cover back to our rooms. Here we sat in silence, listening to the sky opening up overhead. This was the perfect time to write to you and catch up on reading. Reading Mr. Bourdain’s book only succeeded in making me hungry. Which was perfect as it was now time for lunch. Wrapped in a fluffy, white towel, we dodged raindrops down to lunch. 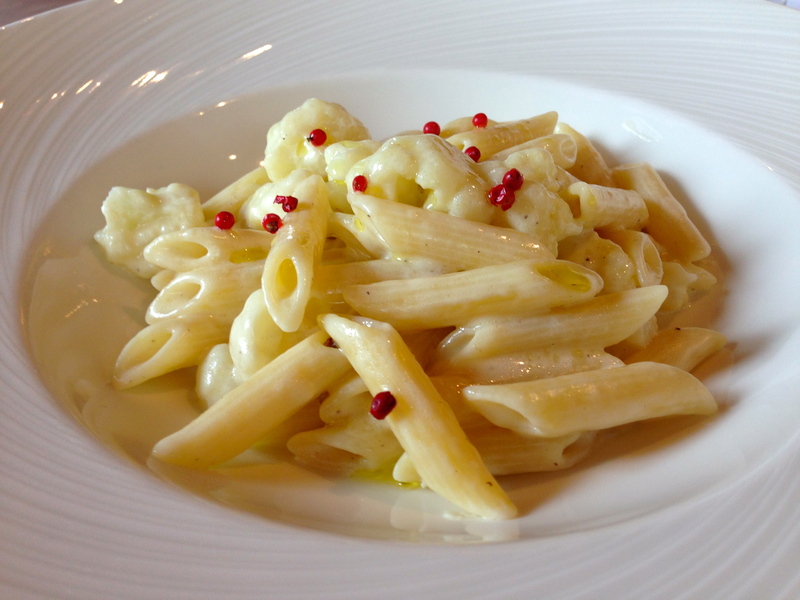 A beautiful bowl of fresh cauliflower pasta with olive oil and pink peppercorns was just the thing we needed. 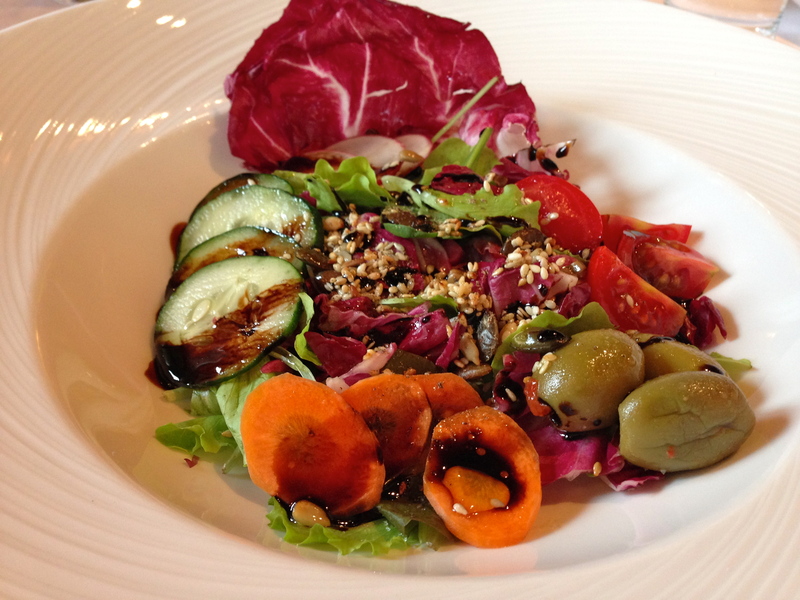 This was followed by a fresh salad with simple, but incredible tasting ingredients. 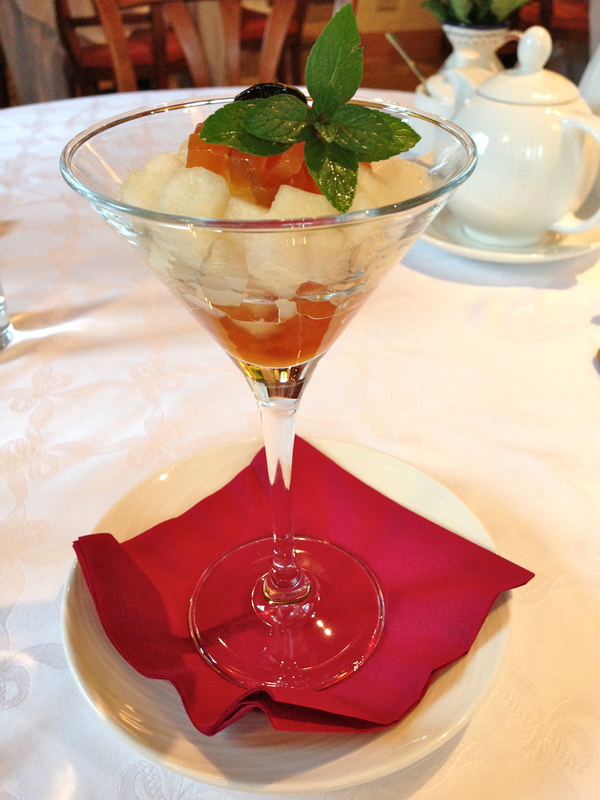 A winter melon and amarena compote was a delicious, light end to lunch. We spent the afternoon chatting, playing Italian card games from my childhood and sitting outside watching the rain fall and lightning strike from the sky. Eventually we retreated back to our room, led by a very wet Piccolo and took shelter for the afternoon. The weather forced us to relax as we were trapped by one very angry mother nature. 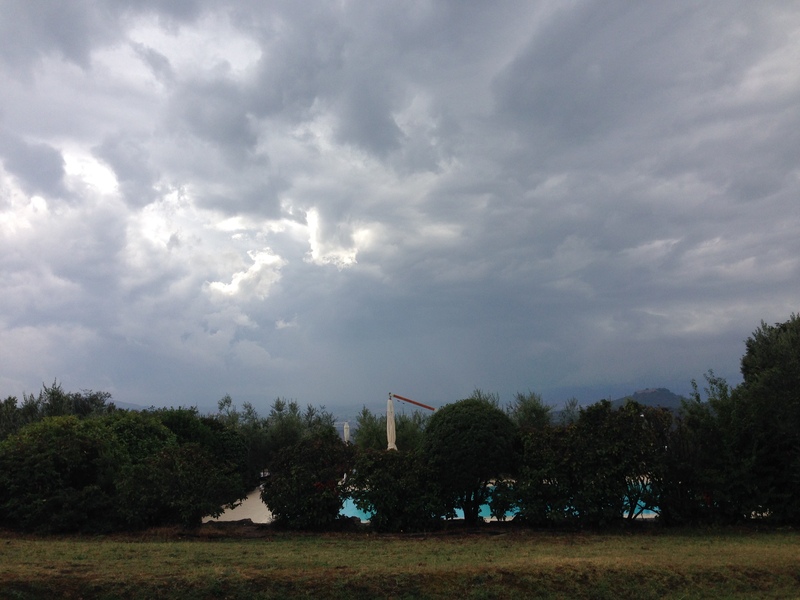 Water continued to bucket down from the sky, thunder and wind shook the windows and lightning struck the mountains. 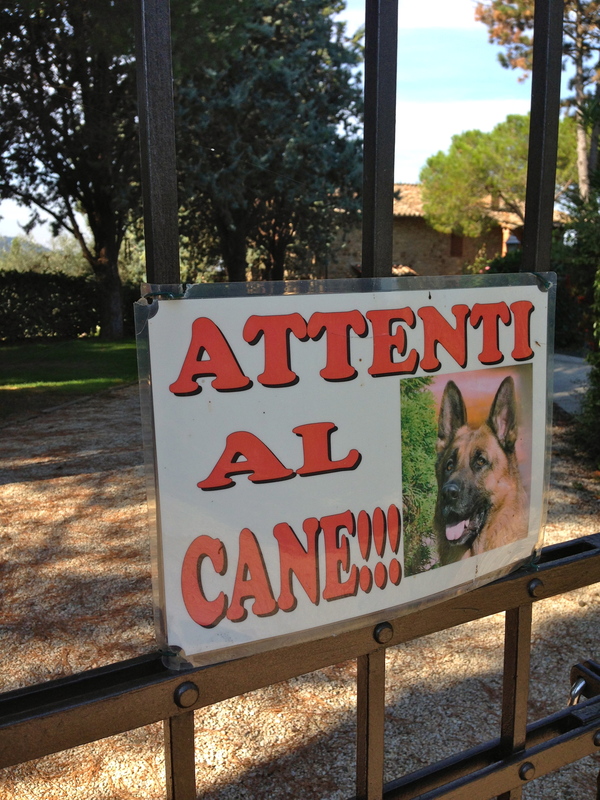 Luckily, The Country House Montali was not a target this time. Alberto entertained us with stories of previous disasters brought on by these storms and we considered ourselves lucky to only play witness the brilliant show. Starving and stir crazy, we were more than excited, if not a little sad, for our final dinner at The Country House Montali. 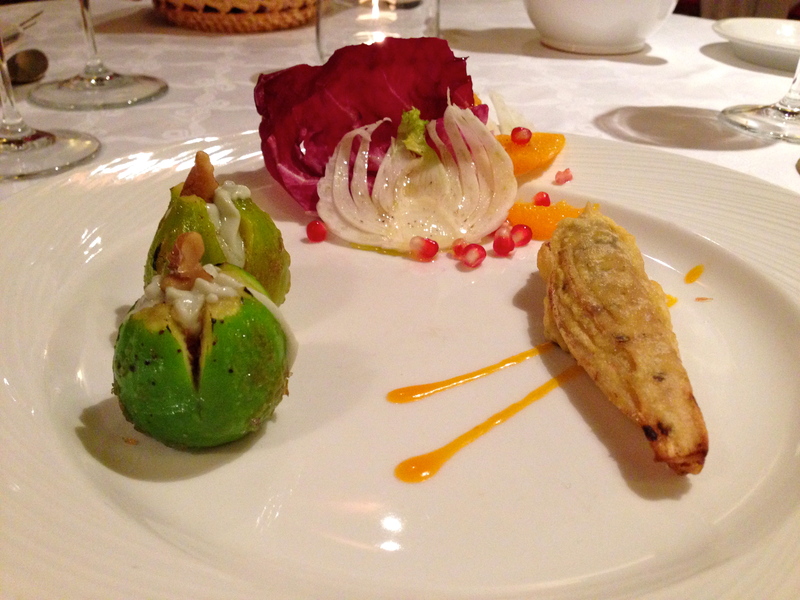 To start, figs with roquefort cheese, toasted walnut and endive tempura. Then, the ultimate comfort food. 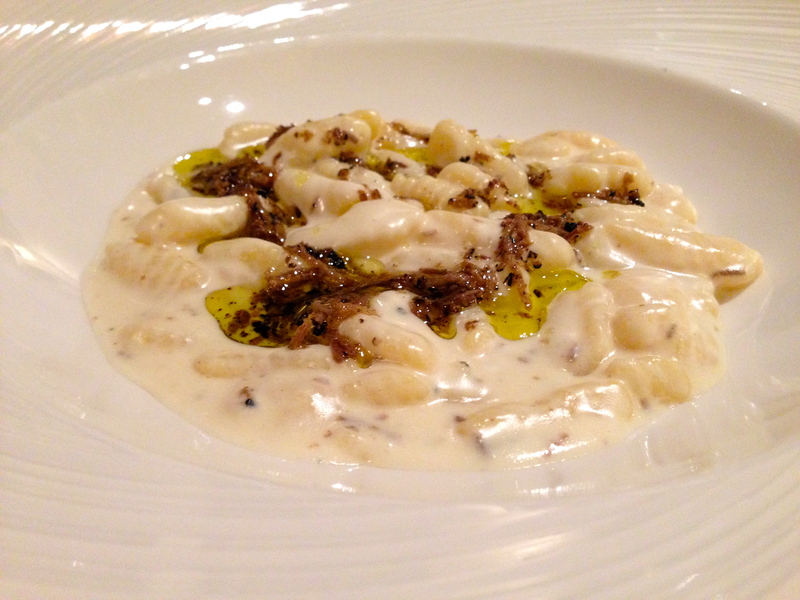 Four cheese gnocchi with salsa di tartufo. 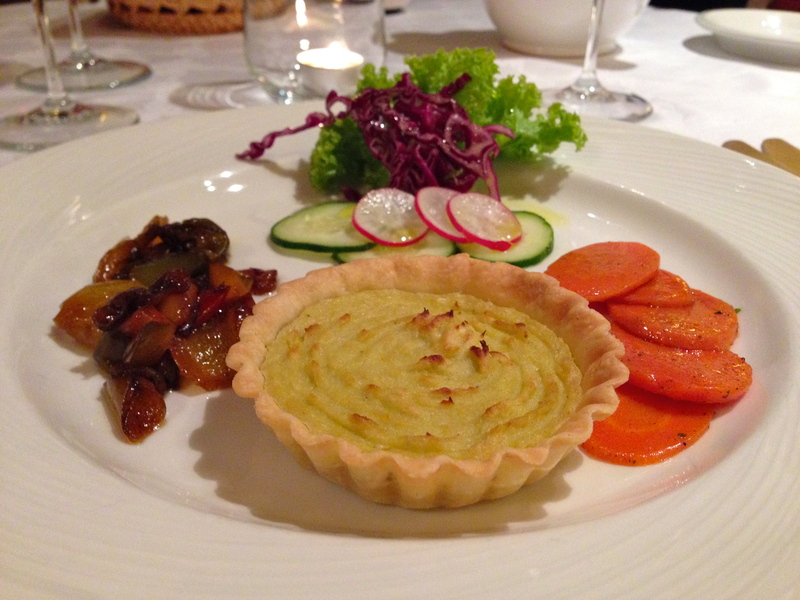 A leek quiche with marinetti carrots and sweet & sour peppers followed. 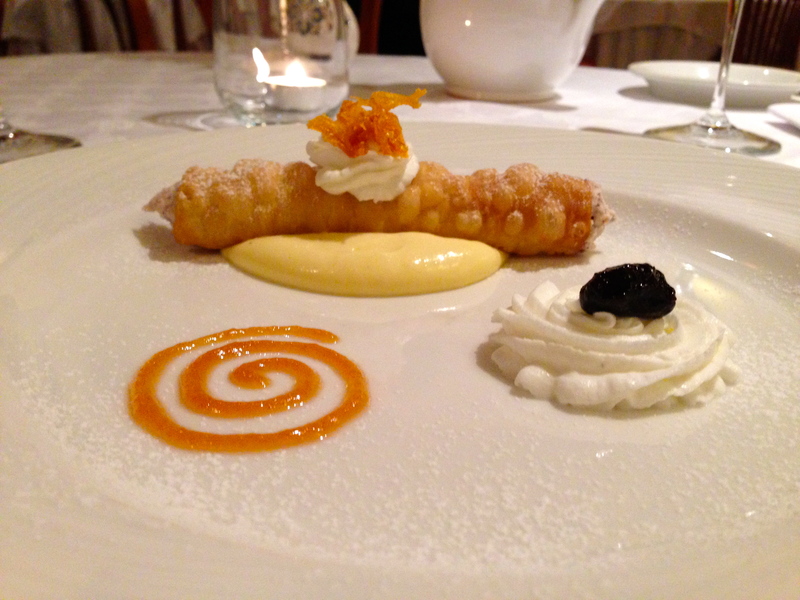 And a traditional cannolo alla Siciliana was our final treat for the evening. 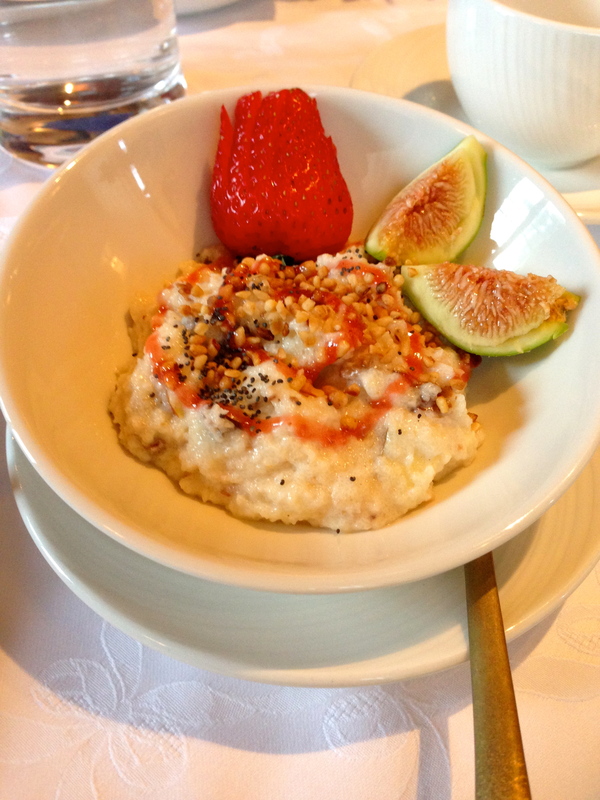 In the morning we awoke to blue skies and Indian porridge. Sadly, we packed our bags into the taxi, said our goodbyes to our lovely hosts and The Country House Montali’s incredible staff and headed for the airport. 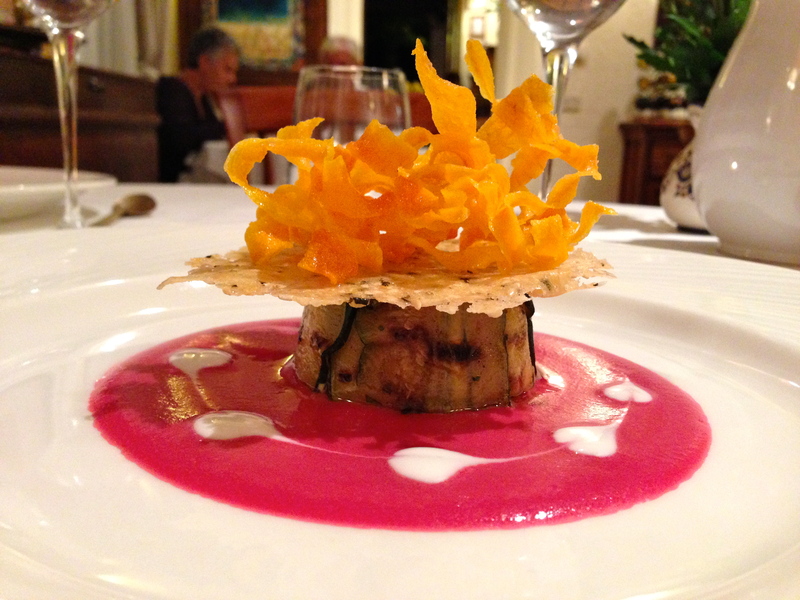 My four days at The Country House Montali were incredible. 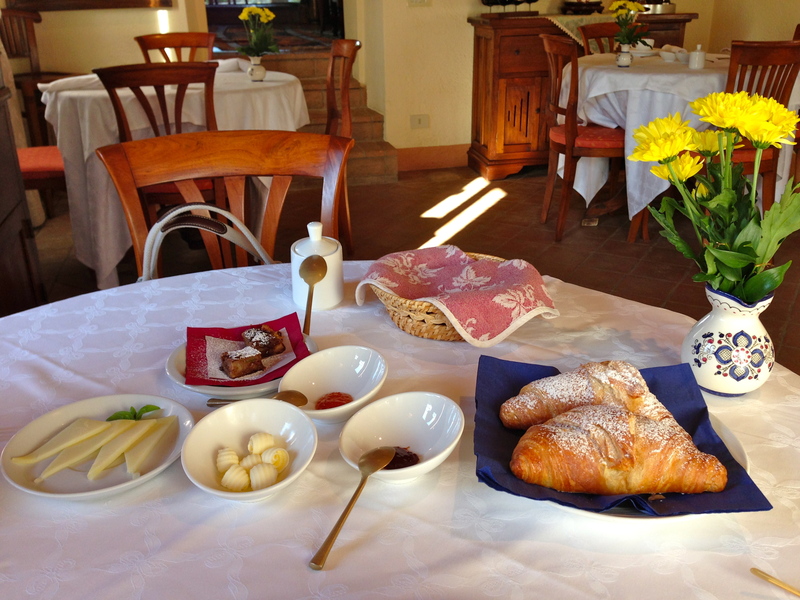 The Italian hospitality makes you feel as if you are home, scenery is breathtaking and food is comprised of inventive dishes, each more delicious and exciting than the last. They are now closed for the winter, but don’t worry! They open again in April of next year. I’ll post the website here for you to enquire more. 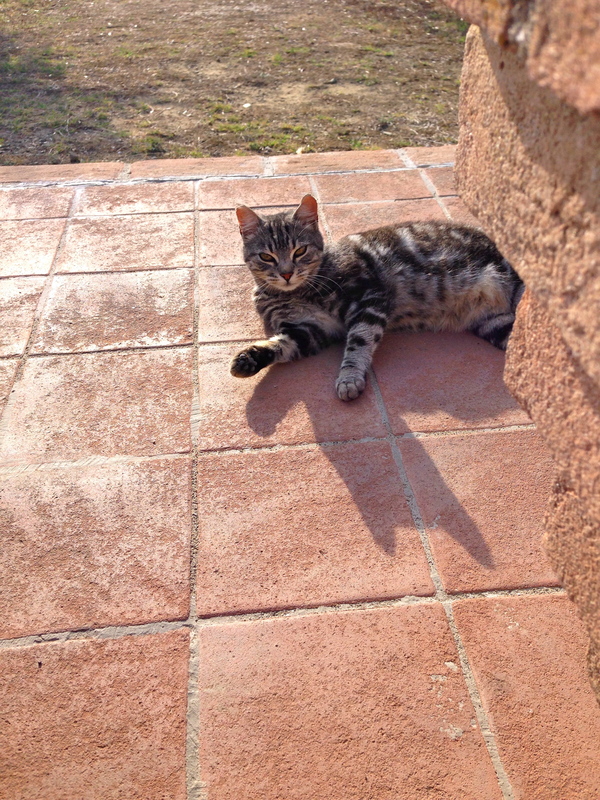 Promise me if you go, you’ll give a little cuddle to Leo & Piccolo for me!